These amethyst beads really shine. Their unusual cut with semi faceted edges and flat sides gives off a lot light. 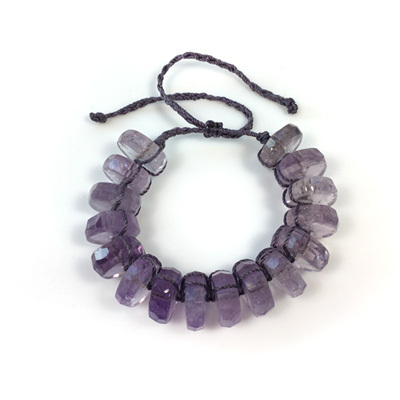 The bracelet is knotted and braidedwith nylon cord in a muted shade of dark lavender that compliments the amethyst beads. One size fits all. 16 beads (16 mm x 6 mm) knotted with nylon cord. Sliding closure. Adjust to wrist size. + 1 available to be made just for you!